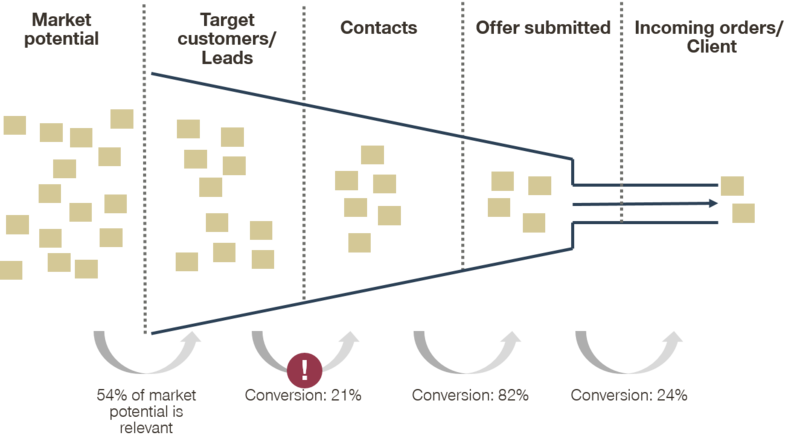 Most companies conduct at least some standard analyses. When used properly, they can help you to identify opportunities and improve your sales approach. One common example is customer segmentation. However, in this article we want to focus on analyses that go beyond the standard. These will help you to understand your sales issues and are the first step to boosting your sales efficiency and effectiveness. A very important question for every company to answer is how much value is delivered in return for the price paid by the customer. This is where analyses come in — helping you to strategically determine your target market positioning along with ways to steer your company’s day-to-day performance. 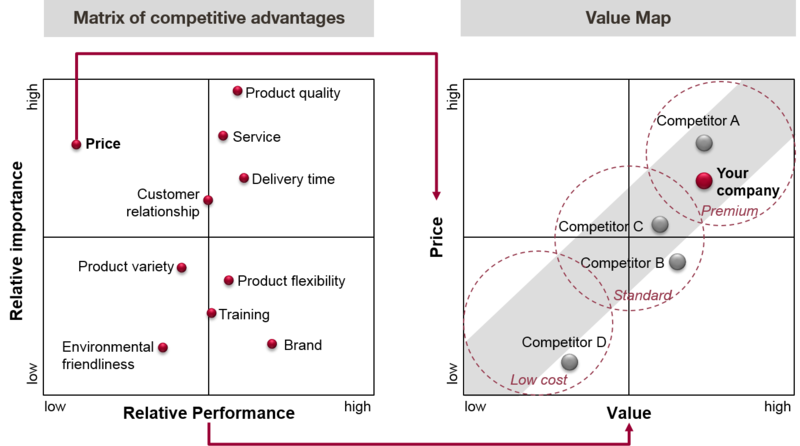 In the example below, the matrix of competitive advantages provides a detailed performance overview, accompanied by a value map, which is a great tool to visualize your positioning. The first step is to rate the importance of potential buying criteria, then use them to assess your company’s and competitors’ performance. You have to rate everything from a customer perspective, or, even better, ask your customers directly. The Matrix of competitive advantages provides an overview of the criteria where you are outperforming the competition, along with the areas where you are falling behind. For the Value map, aggregate all of the buying criteria on the horizontal “Value” axis, except from price, which is then represented on your vertical axis. With this map you can decide on the direction in which to move your company (price up/down and/or value up/down), and once you know this, the Matrix of competitive advantages on the left side provides you with the levers to make it happen. E.g. if you want to increase value, take the most important criteria and improve your performance in these areas. Do you know how much time your sales reps spend on which activities per day or in an average week? The activity analysis shows you whether or not your sales team is making the most effective use of their time. Having all your sales reps fill out a very short questionnaire is one easy way to do this. In many cases, sales reps waste their time on internal meetings or avoidable administrative tasks. This doesn’t mean the tasks are unnecessary, just that the processes should be as lean as possible and the organization should support reps so that more time can be spent on sales. In best in class companies, sales reps are able to dedicate more than 75% of their time to core sales activities. The sales funnel is probably one of the most basic yet neglected analyses, which is usually due to an inadequate CRM system. Sales reps are naturally reluctant to enter their knowledge and data into an IT system and they don’t want to be monitored. However, as a company, you need to know where in the sales process opportunities are being missed. In the example above, the low conversion rate from “Target customers” to “Contacts” is a cause for concern and probably means you’re not securing enough meetings with your target customers. Once you have this information, you can go a level deeper and analyse the reasons. It might be that the content you’re distributing is insufficient or not attractive enough to your audience, or you’re not doing a good job with follow-up calls, e-mails etc. These are the areas you have to work on. But adjusting your offers by lowering the price or including more fancy slides won’t help here. You might feel better having done something, but it won’t solve your problem. The solution would be to successfully organize more meetings with potential clients by improving your first contact or follow-up process material. There are a couple of things you have to look at when it comes to the sales structure. This is always a very sensitive topic and a possible change needs to be considered carefully. To see if there are any imbalances in the sales structure you should first analyse the revenue per full time equivalent (FTE). Sales reps or teams are typically based on regions, products or applications. If one division generates significantly more revenue per FTE, something is wrong. It might be the product categories are so different that it isn’t fair to compare them, which means they shouldn’t be on the same level. Let’s take Region 6 as an example. It appears to be in the project business while the rest are more or less in the standard business. Another explanation is that the regions are not well split up (different revenue potential) or that the sales reps’ performance is different. In any case, this is a sign that you have to adjust and reorganize your sales structure. A well balanced sales structure won’t turn poor sales reps into great ones, but it can create the basis for improving their skills. The low performing sales reps learn from the best and at the same time strive to no longer be outperformed by their peers. Structure is important, but it’s the people that count. Yes, having the right structure is a basis, but that alone won’t lead to the right results if you don’t have the right people on board. On the other hand, the right people can overcome the issues of a slightly flawed sales structure. The kind of people you need depends very much on your company’s goals. 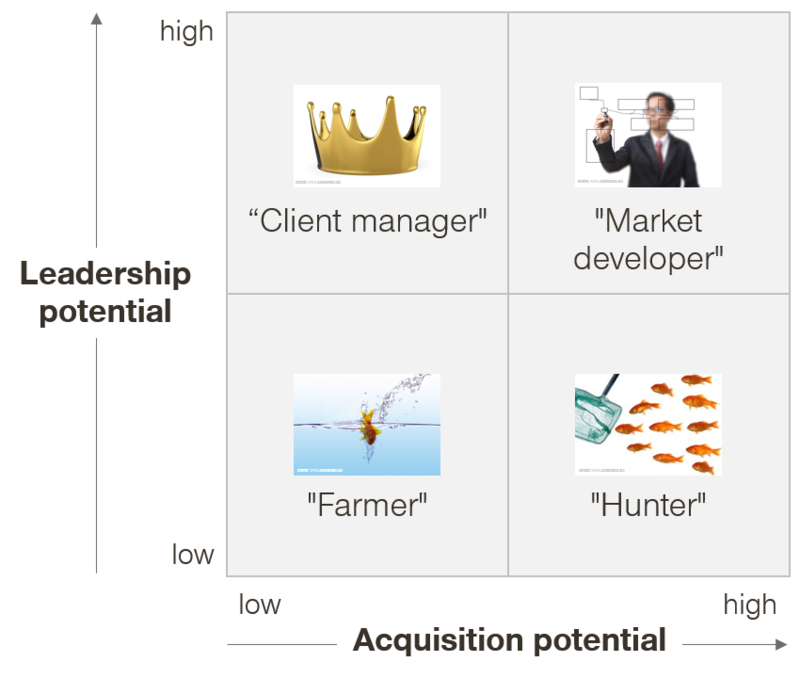 If you want to win new customers or attack completely new customer segments you might need a lot of “Hunters” in your organisation. If there are no new customers to acquire but you have to nurture the existing customer base, you might be happy with a team of “Client managers” and “Farmers”. Entering completely new markets or market segments is a task for a “Market developer”. Only few people have this skillset and they’re typically very expensive. But for companies that are aiming to grow and expand, they are absolutely crucial. So define your goals, analyse what kind of people you already have and add whatever skillset is missing to your organization.